LANCASTER COUNTY, Pennsylvania – Sight & Sound Theatres, one of the world's most unique and successful Biblically-based theater companies, is dedicated to "Bringing the Bible to Life" with an ongoing series of immersive stage productions depicting Christian stories that often break through the "fourth wall" and directly engage the audience. Owned by the Eshelman Family, Sight & Sound Theatres has hosted more than 15 million guests since its founding in 1976. Recently, Sight & Sound Theatres ensured an even more engaging audio experience for its guests with an upgrade to a HARMAN Studer Vista X digital mixing console. Sight & Sound Theatre's primary location is a 2,000-seat theater in Lancaster County, Pennsylvania, with a second theater in Branson, Missouri. Sight & Sound's productions typically begin in Lancaster County before moving on to the Branson location. "We provide our audiences with a very immersive experience that goes beyond a typical theatrical production," said Gary Parke, Audio Operations Supervisor for Sight & Sound Theatres. "In fact, both theaters have additional stages to the side of the main stage, so that a lot of our shows feature a 180-degree stage setup." 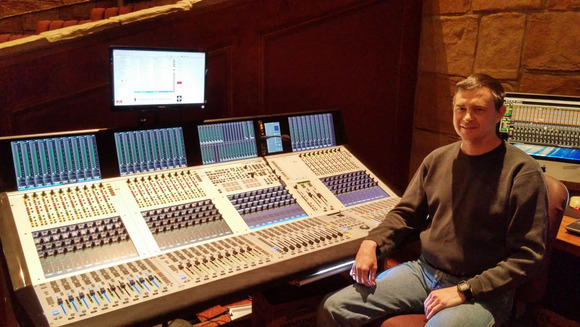 Looking to add to this immersive experience, the addition of the Studer Vista X digital console to the Lancaster County Theater marks a massive improvement in audio quality. Furthermore, the console's ease of use relative to its limitless capabilities made it an attractive option for Parke, who oversees all the programming for Sight & Sound Theatres. "Flexibility and input/output count were big factors in choosing the Vista X," Parke noted. "The ability to build our I/O configuration to our exact preferences was a very attractive feature." The Studer Vista X offers an unsurpassed intuitive user interface and features Studer's patented Vistonics™ and FaderGlow™ features, while providing control of 800 or more audio DSP channels and more than 5,000 inputs and outputs. At the heart of the system is the Infinity DSP core, which uses CPU-based processors to provide huge numbers of DSP channels for large-scale, high-resolution audio processing and mixing. The theater is currently using 64 wireless microphones and playing back the audio via Steinberg Nuendo audio software. All audio will be fed into the Vista X via Audinate's Dante networking technology. "In addition to the I/O flexibility, the Vista X will make it so easy to be creative in developing a realistic audio atmosphere for the audience, so we can create ambient sound effects that really make guests feel like they're part of the story," Parke said. "The Vista X gives us so much more flexibility than we have had before."